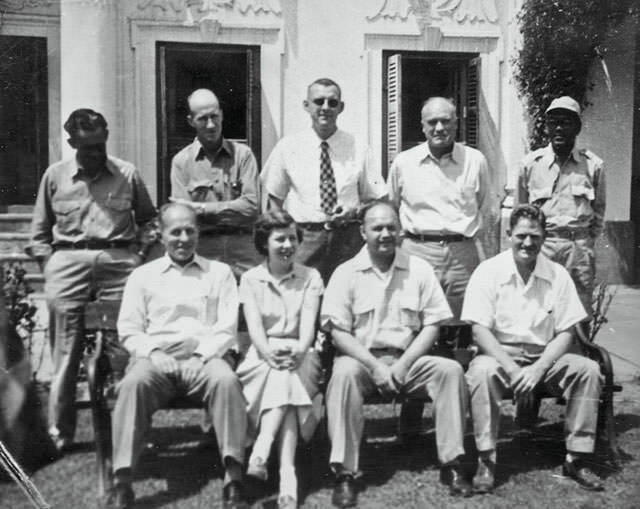 PIONEER DEVELOPERS: Paul Rose (seated second from right) and George Brooks (far right) with the US Operations Mission Team in Kathmandu in the early 1950s. A few days after Christmas of 1952, Paul W. Rose, the highest-ranking American based in Nepal, left Kathmandu with several Nepali, American, and European colleagues for a reconnaissance trip to Chitwan, then often referred to as the Rapti Valley. Rose was the director of the newly established U.S. Operations Mission (USOM), the precursor to USAID and the sole American presence in Nepal until an embassy was established in the late 1950s. Rose's group showed that foreign development was truly a mixed affair. Accompanying Rose were Ganga Bickram Sijapati, Director of Nepal's Department of Agriculture; George “Jud” Bowers, an American economist posted with the USOM; Dr. George T. (“Tal”); Brooks, an African American entomologist from Nebraska posted with the USOM; a Swedist agronomist named Goran Knutson; and Sam Theuvenet, a Dutch irrigation engineer with the FAO. They all believed in something called ‘development’, but each gave it his own institutional, national, disciplinary, and personal interpretation. Rose and his team were inventing ‘international development’, the wave of programs that would shape not just Nepal but much of what was then called the ‘Third World’. Nepal's Secretary for Development and Planning B B Pande had recommended Chitwan. A few years earlier, after visiting the Tennessee Valley Authority projects in the U. S., Pande felt Chitwan could benefit from similar multi-sectorial planning. The group traveled by the only means available: on foot. The Hetauda to Kathmandu road had yet to be built. Geography explained Nepal's remoteness and also its politics – it was a country ‘locked in by history’. But now the country was opening up after Indian independence, the departure of the Ranas, and a spreading Cold War. The Cold War, however, was not just one thing: It changed over time. Individual perspectives also shaped development programs, not just those of people like Rose, but also of Nepali government officials like Pande and the variety of ordinary Nepali villagers who interacted with programs. On the far side of Chitlang Pass, Rose stepped into a scene that helped confirm his particular vision of development: on the trail in front of him he saw 90 barefoot porters struggling to haul an automobile up the mountain slope. The scene crystallised Nepal's core problems for Rose: a lack of basic technology, and even more importantly, political and economic disparities. While a tiny elite could purchase vehicles to carry themselves and their goods, many had no choice but to shoulder the loads of others. Rose saw a similar car being carried to Kathmandu through Chitlang Pass and concluded that Nepal's economic disparities needed to be redressed with connectivity and land reform. A Tennessean educated at the University of Wisconsin and former agricultural extension worker, Rose championed a 1930s ‘New Deal’ faith that government, technology, and better resource management could not just increase production but also improve the lot of ordinary people. A few months earlier, writing about how to do so in Nepal, Rose had stressed how technology could “help develop the human and natural resources of Nepal to the fullest extent’. Rose wanted roads ‘so the burdens of agriculture and industry may roll on wheels rather than to continue to crush the backs and spirits of the people’. He hoped to harness Nepal’s streams to create ‘freedom from floods’, to water crops, and to offer ‘tools that will take the drudgery out of daily labour’. Most importantly, he wanted ‘the tillers of the soil to become the owners of the soil’. That meant land reform. Elsewhere in his writings, he called U.S. programs in Nepal as a ‘prescription for revolutions’. The 1951 revolution, for him, was only a ‘half revolution.’ To those who think of early American development as narrowly technical, Rose's hopes for dramatic political change might come as a surprise. After a day and a half of walking and a few hours in a truck, the team reached Hetauda. The next day the team got to the large Tharu settlement of Jhawani. The predominant group in Chitwan, the Tharus were rice cultivators, cattle herders, and fishermen who had their own culture and language. Unlike hill folk, they carried genetic and acquired immunities to the area's much feared malaria. Rose read Chitwan's grasslands through the lens of US history. The valley appeared to him a frontier: untapped resources waiting to be developed. He later described the valley's 'almost untouched' land—'many thousands of acres of beautiful, level fertile land' that 'looked about the same as the prairie must have appeared to the frontiersmen of America when they went West.' These 'untouched' lands, could help densely populated Nepal become a prosperous democracy. Trying to explain what seemed to be uncultivated land, Rose blamed the area's malaria, but also greedy Rana aristocrats. He believed the old regime had used the valley as a private hunting ground, ignoring the needs and rights of the larger Nepali population. To open the Valley's resources for ordinary people Rose proposed constructing a road, controlling malaria with DDT, and distributing land. This was to be the revolution he hoped for. 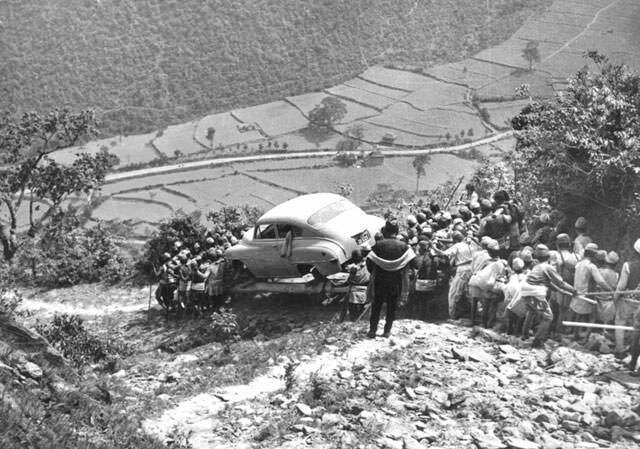 Rose's 1953 trip laid the foundation for the first big American project in Nepal. The decade-long ‘multipurpose’ plan known as the Rapti Valley Development Project (RVDP) combined new technology with socio-economic reform: road building, malaria eradication with the World Health Organisation, village development and, most importantly, land distribution and resettlement. The program languished for a couple years without funding. Then, in late summer of 1954, perhaps the twentieth century's worst floods ravaged the central hills and Tarai, including Chitwan. American disaster relief projects opened the funding taps for the Rapti Project. Sadly, Rose's vision of socio-economic leveling in Chitwan was mostly not to be. Malaria was eliminated, Chitwan did become an economic breadbasket for Nepal, and many poor people did receive land, some of which they or their families still own today. But development programs rarely unfold as expected. But ‘land distribution’ in Chitwan was far from equitable. 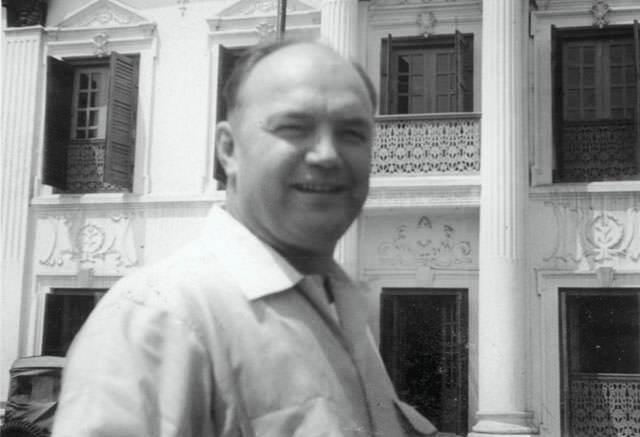 ‘Too many large landholdings were sold to politicians in Kathmandu whose sole interest, in most cases, was a quick return,’ noted Eugene Mihaly in 1965. The Tharus' fate deteriorated not because the RVDP ignored them or pushed them aside. In fact, the program, led by Rose and counterpart Krishna Bam Malla, worked hard to give Tharu tenant cultivators and herders their own land. Yet good intentions didn't carry the day, and only a few Tharus actually obtained land, fuelling decades of poverty. That, however, is a long, complicated story for another day. Tom Robertson is an environmental historian and Executive Director of Fulbright Nepal. A longer version of this article will appear in the Journal of American History in March. Ceasefire and peace talks, this time between the king and parties. Lets look beyond criticism and pessimism.